Cloepatra VII was one of several brothers and sisters born of Ptolemy XII “Auletes” (the flute player): she was perhaps the third offspring of the first wife or first of the second wife, but at any rate born whilst her mother was Queen of Egypt. As such she was doomed to live a life of court intrigue and assassinations in the court of Alexandria (Egypt). Within that turmoil she was able to take fate in her own future and to turn events to her favour, largely thanks to her courage, intelligence and undoubtable charm, not to mention limitless ambition and her belief in herself as a divine being. The end result shows that fortune wasn’t with her all the way and that indeed she was struck by some unforeseeable misfortunes such as the assassination of Julius Caesar and his will which placed the cold and calculating Octavian into power. Perhaps the height of her success was achieved when she resided in Rome, guest of Julius Caesar, mother of his son, with a statue of herself as the goddess Isis, erected in Caesar’s forum next to that of the goddess Venus. Surely at that point she must have believed she had not only saved the Ptolemaic dynasty and its control over Egypt but gone further and secured the beginning of an even greater dynasty which would rule the world. The absurd and unexpected assassination of Julius Caesar was to force her to back into a world of turmoil and a fresh alliance with Roman power through her affair with Mark Anthony which ended with her own death. Only as of 2009 has news reached the media of the possible discovery of their tomb but their memory has lived on through the centuries in countless tales, not least of which by the great bard Shakespeare and countless paintings by great masters of all periods. Skip to the general plot and story of Cleopatra or read on to understand the ingredients. The story of Cleopatra and Anthony is a story of intrigue, wealth, power struggles, divinities and portents on a global scale. The actors within such a story were men and women of great fame spanning centuries, starting with Alexander the Great who lived centuries before and ending with Emperor Augustus who saw her death: the name of Cleopatra and the part she played in history echoes on to this day. The tale of Cleopatra is also fascinating because we cannot judge Cleopatra as the “good” or the “bad”: Cleopatra and Augustus were similar in many ways, not least of which was their limitless ambition and ability to act in a cold and calculated fashion. Whilst we might judge Augustus negatively for the assassination of Caesar’s and Cleopatra’s son we can equally judge Cleopatra negatively for eliminating her own brother Ptolemy XIV or watching on as her sister Berenice was done away with in Julius Caesar’s triumph: These were different times when the value of human life was regarded rather differently from nowadays. We should bear this consideration in mind when thinking of the literary sources available to us: history was written by the victors and as such Cleopatra tends to have been portrayed as a conniving trickster, bent on using her womanly charms to bend men of power such as Caesar and Mark Anthony to her own will and against the good of Rome and the Roman people. The reality is more likely that of a woman who fought like a tiger to defend her throne, extend the influence of Egypt and protect the life of her son with Caesar, Caesarion. She was the last real hurdle to Rome’s control over the Mediterranean. The political and social context within she found herself to act – wealth lay in the Orient and Rome’s power lay West. The history and inheritance she was generated by – She was of Greek Macedonian extraction although ruling over Egypt. The power struggles and events which were unfolding in Rome: the Republican system was falling apart and giving way to the civil war. Much of the story of Cleopatra and of Egypt’s sovereignty can be understood in the key of Egypt’s great wealth and strategic position in the trade routes between West and Orient: rule over Egypt meant direct access to great wealth but it also implied access to great power. The Romans themselves had put off annexing Egypt as a province in spite of having a stranglehold on political power since a good 50 years earlier: Survival of the Roman Republic required a balance of power and whoever should be given the power to govern those rich lands would become so powerful as to be a threat to Rome itself! People, places and events which will be mentioned include: Alexander the Great, Julius Caesar, Silla (or Sulla), Cicero, Roman Senate, Alexandria, Ptolemaic dynasty, Egypt, Augustus, The first triumvirate and Second Triumvirate, Pompey the Great, Mark Anthony, Dionisus, Venus, Isis, The great library of Alexandria, Naval warfare. The great battles of Pharsalus and Actium decided the future of the Roman empire and western history in many ways. This episode of Roman history also had great and lasting impact on the Roman economy. During its 300 years of rule the Ptolemaic dynasty was ruthlessly efficient in fostering Egypt’s wealth to consolidate their own power: whilst they distributed land tenancies to their militia to ensure territorial control they adopted the Egyptian religious system and hence assured themselves divine legitimacy of power. They applied the sciences coupled with a well articulated bureaucracy in order to maximise wealth creation as well as taxation of it. With the sudden death of Alexander the Great in 323 BC a period of instability followed. Alexander had died, perhaps poisoned , but his body wasn’t decomposing and his fame was certainly to live on: The body was conserved three years in honey before finding a final resting place. One of Alexander’s most able generals was Ptolemy who secured Egypt for himself, successfully defended it and hadAlexander’s body transferred to Egypt from Babilon. The body was taken to the city the great general had founded and buried there: Alexandria. Like the mystery which surrounds the destruction of the great library at Alexandria, mystery shrouds Alexander’s burial place: it was prominent in the city and indeed it was the site where the Ptolemaic dynasty was buried. Alexander’s fame was such that Caesar is said to have wept on seeing a statue of the great man in Spain. Later, the Roman soldiers of Emperor Septimus Severus had it sealed and the great tomb has since been shrouded in mistery. Cassius Dio also relates an amusing although unlikely story concerning Augustus’ visit to Alexander’s tomb at Alexandria in the year 30BC: On approaching the body of the great general to kiss the body, Augustus broke the nose off by mistake! If you wish to learn more about Alexander the Great we suggest the following resource: Alexander the Great study guide – “the question of divinity” – a succinct account of his life and influence. Ptolemy I had chosen well when he chose Egypt for himself: A rich territory, well defendable with sea and deserts around it inhabited by an ultra conservative population used to an autocratic ruling system and strong faith in the divine descendency of their rulers. Egypt was rich with metals and gems and the Nile was an unbelievable source of great advantage: fertile land as well as a mode of transport through great territories. Ptolemy’s successor strengthened the position created by Ptolemy I and by the time of Ptolemy III the combination of Greek and Egyptian cultures had brought wealth and prosperity back to Egypt. Agricultural revolution, good bureaucratic machinery, Science and a fostering of the Arts culminated in the knowledge collected within the great library at Alexandria. However, in combining the Greek and Egyptian cultures into a single dynasty, the Ptolemy’s had also adopted many of the Egyptian traditions, including that of incestuous marriage between ruling Pharoah and his consort and of course the court intrigue that went with the intricate Egyptian court life. The remarkably dissolute Ptolemy IV marked the beginning of general decadence until the reign of Ptolemy XII Aeuletes (Cleopatra’s father): Assassination. Amazing court plots and incestuous marriages with a side helping of murders amongst family members were the order of the day. Ptolemy XI was a wonderful example of this, having married his own step mother and half sister (possibly actually his mother) and 19 days later murdered her. Cleopatra’s father was Ptolemy XII who fashioned himself “Neos Dionysos” (New Dionysus). He wasn’t of direct lineage but rather an illegitimate son of Ptolemy IX and took over the rather difficult situation left by his predecessor Ptolemy XI (the one who murdered his wife/mother). The latter was overthrown by the population for being subservient to the Romans and for the means by which he had done away with his wife/mother who was much loved by the population. Ptolemy XII isn’t regarded a monarch of great skill and focus but rather as a man of weak character, little courage, a love for courtly pleasures and music (hence his nickname). This view is exemplified by his personal plead for assistance from the same general (Cato the younger) who had killed his brother in Cyprus and breached agreements made with Rome. Having said that, he wasn’t lacking in some qualities at least: in the great turmoil managed to lose and then regain the throne, do away with his Roman creditors without dirtying his hands and spent the last years of his life enjoying the courtly pleasures. his position as puppet ruler of Egypt which enabled a political stalemate within Rome’s corridors of power: many in Rome feared that whoever would take over running the new, rich, colony would himself become a threat to the hegemony of Rome itself and its status of capital of the world. The “New Dionysus” therefore started on a back foot which could only be resolved by further subservience to Rome, leveraging corruption and wealth to find protection of his position from generals such as Julius Caesar, who in need of Egyptian financing had a law passed in the Senate to recognise the legality of Ptolemy’s position as ruler of Egypt. In a similar vein Pompey the Great supported Ptolemy’s return to power when the Egyptians had forced him to flee. Cleopatra herself wasn’t Ptolemy’s oldest daughter. Nor is it clear whether she was the youngest daughter of his first wife (Cleopatra VI) or the eldest of his second wife. The only thing we can know with some certainty is that in 55BC she was the eldest claim to the throne: when her mother was in power and her father’s forceful return to power, aided by Roman support, brought the death of her elder sister Berenice. Cleopatra’s life, her courtly intrigues and struggle to hold on to her throne unfolded in parallel with the great events which shook Roman society: Rome had conquered much of the West and the future expansion (and wealth) lay Eastward. This was a period of ongoing civil war in Rome and of the “First Triumvirate” between the genial Caesar, Pompey the Great and the fabulously rich Crassus. A period when the Republic’s survival as such depended on a meticulous balance of power between opposing factions, when Pompey feared that Caesar’s success in Gaul would overshadow him and when great orators such as Cicero feared for the nearing end of the Republic. This proved to be a moment when the Roman Republic could have mutated into either an Oriental styled dynastic kingdom or an equally autocratic Empire based in Rome. It is curious to notice that in due course, the Roman Empire was characterised by an increasingly orientalised style of despotism and its fortunes eventually revived by shifting it’s capital eastward to Constantinople! Perhaps great men such as Caesar could see that the Orient was where the future had to lay, but for the time being such a destiny was to be thwarted by the meteoric rise of Caesar’s heir Augustus and the death of the mercurial (or should I say, Dionisiac) Anthony with his lover Cleopatra. Cleopatra’s image in ancient Rome held some parallelisms with the growing moralist view of that time concerning Oriental luxuries: that their accessibility and lure was weakening the moral fabric of the Roman people. Even today Cleopatra is famed for her beauty or perhaps more correctly her appeal, an image greatly nurtured by Roman writers to underpin the Emperor’s propaganda of her as a seductress driven by vice. Her nose has some notoriety as does her use of cosmetics and beauty treatments. Her fiery relationship with Mark Anthony is the stuff of unforgettable drama: She is also famed for a regal suicide by use of an Asp hidden in a bowl of figs. A variety of accounts would have her bitten on the arm others on the breast and yet others suggested it was suicide by poison. Nevertheless a clamorous suicide to avoid the injury of being walked in chains through the streets of Rome for Octavian’s triumphal march. She was buried next to her lover Mark Anthony, unawares by then that her beloved son had also been put to death by strangulation. No sculptured busts which can be proven true to life have been found of her and so the only figurative notions we have of her semblance is through some coins which portray her in her youth and in later years. We also have some descriptions of her. We have no notion of whether she was dark haired or blond, dark or light skinned. She was likely of east Mediterranean looks. Her famous nose might suggest a middle eastern/judaic influence. The sources we have at hand to understand Cleopatra’s portrait, both physical and in terms of character, are therefore indirect. Literary accounts of her are largely written by people who hadn’t known her and indeed wrote about her much after she herself had lived. To this we may add that they are written by Romans subservient to Augustus’ propaganda machine. Ie we have to read between the lines as best we can. Smuggling herself into the royal palace at Alexandria rolled up in a carpet: She hid and had herself carried, rolled up in a carpet on a slave’s shoulder so that she might personally meet Julius Caesar in spite of her brother Ptolemy XIII. This tells us of her likely small stature as much as it does of her ambition, courage and determination to fight her cause, first against her brother and later against Rome itself. Unwavering in the face of the lesser means available to her with respect to her adversaries. Her pressing Mark Anthony to donate the library of Pergamon to Alexandria, thus enlarging the Alexandrian library to unprecedented levels, attests to her continued attention to the importance of the arts and sciences. Her insistence on remaining at the site of battle at Actium – probably hoping to be present at Octavian’s defeat rather than her own. Details which attest to a woman who had many facets and was out of the ordinary in many ways, first and foremost in terms of ambition and drive. Cleopatra’s story as a whole tells us of a woman who fought with courage to save her children born of Caesar and of Marc Anthony, fought for her throne and for Egypt itself to defend her own from subservience to Rome. Highly intelligent. Capable of using her mind over her personal desires. A convincing actress when necessary, capable of playing the necessary role to enchant first Julius Caesar and then Marc Anthony: two men of very different character and qualities, both of them extraordinary men in their own right. Following family tradition she protected and devoted resources to the arts and sciences but was also able to think and fight for herself: she was the first in her 300 year long dynasty to learn the Egyptian language of her subjects, in fact she reputedly spoke a broad variety of languages and seldom required a translator. In terms of her physical beauty it seems she wasn’t particularly stunning, but rather able to make use of her good proportions in combination with her intelligence and ability for intellectual conversation. Clearly a consumate politician, a good judge of character and literate to a sufficient degree to enable a level of dialogue such as would draw a man such as Julius Caesar on the one hand and Marc Anthony on the other: both of them well known for their amorous affairs and unlikely to fall simply because of good looks. 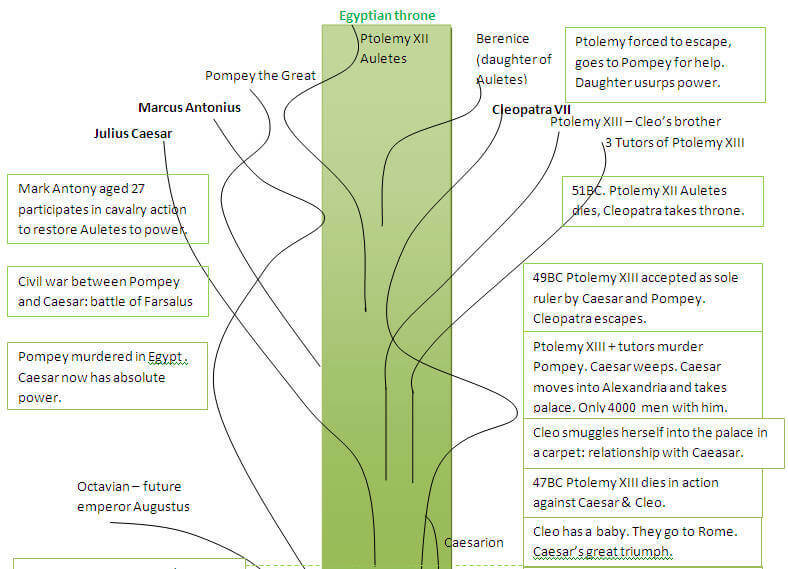 The following diagram has been drawn to give a simple idea of the many threads of the story of Cleopatra, It is by no means exact but close enough to help us to describe the plot (below). The central green stripe represents the Egyptian thrown and power. Ptolemy XI, Cleopatra’s father’s predecessor was dethroned by the Egyptian people for having murdered his recent wife (who happened to be his mother!) His reason for murdering her is unclear other than a desire to take absolute power and severe miscalculation as to how well his people would take it. Ptolemy XII was next in line: illegitimate offspring but nevertheless of blood line descendency. Unfortunately for him, on taking the throne Ptolemy XII Auletes came to find out that his predecessor had left a will within which he named the Roman people heir to the throne in compensation for Roman aid in keeping him on the throne. As negative as one might be about Auletes one thing has to be said for him: he managed to convince the Romans into proclaiming him rightful ruler of Egypt, he eliminated immediate threats to his power, paid of his debts (essentially by framing his Roman creditors so that the Romans would themselves carry them off in chains) and perhaps most importantly – he died enjoying life and his flute. Meanwhile the unrest in the Roman political landscape was turning into outright civil war. The First Triumvirate had falled apart and turned into a head-to-head between the two factions headed by Julius Caesar and Pompey. Caesar took Rome as Pompey retreated to Brindisi. Caesar gave chase but Pompey got away to Farsalus (Pharsalus) where he lost a pitched battle which he should have won but failed to finish off. Pompey retook flight and made for Egypt where he expected help and support in exchange for past favours. At this time Cleopatra’s younger brother Ptolemy XIII and his three tutors had forced Cleopatra to flee the country. Uncertain of how to respond to Pompey’s request they chose to murder Pompey and hand his head to Caesar – likely quite normal for the standards of Egyptian court intrigue but this was taken rather negatively by Caesar who had moved into the palace at Alexandria with only a small force of 4000 men. Caesar’s objective at this point in time was still that of executing Ptolemy Auletes’ will of having his eldest son and daughter take the throne together. At this point Cleopatra showed her consumate skill and daring, very much in tune with Caesar’s own character, she had herself smuggled into the country and indeed into Caesar’s personal quarters, rolled up in a carpet on her slave’s shoulder (a detail which in itself suggests she was likely of slight build rather than large). This first encounter was sufficient to spark a romance that was to mark a significant period in Caesar’s life: likely the first “holiday” he ever took resulted once he’d turned the tables on Cleopatra’s brother against numerical odds. ptolemy XIII died in battle and was found drowned. Caesar took power and had himself several months worth of trip up the Nile to explore the country’s riches, with Cleopatra. This was a period where nothing could go wrong for Caesar: he had Egypt and all the country’s riches, he had a child from Cleopatra as well as innumerable victories on the battle field. The famous “Veni Vidi Vici” was coined at this time, for his over-the-top military triumph in Rome which involved countless riches and what we would nowadays regard as an environmental disaster in terms of animals slain at the Venatorial games. Cleopatra had moved to Rome at this time with their child whilst Caesar had moved in to his own home with his official wife. Cleopatra didn’t attend the triumph at which her own sister Berenice would have been walked in chains, but she did have a great prize of her own: her own statue as the embodiment of the goddes Isis stood next to that of the goddess Venus in Caesar’s forum. Cleopatra must have thought her gambles, risks and political skills had paid off: as the mother of Caesar’s child she was certainly destined to be the queen of a new Graeco-Roman dynasty which would stretch the boundaries of the Ptolemaic kingdom further than her forefathers would have ever dreamt of. Unfortunately kingship and oriental rule were precisely the sort of dream so abhorrent to Roman citizens that it would prove their undoing. Interestingly it was precisely the path followed some 300 years later by Emperor Constantine in his bid to revive the Empire’s failing fortunes. As superstitious as the Romans were they failed to act on the numerous premonitory and supernatural events preceding Caesar’s assassination. Cleopatra must surely have had a good number of her own ill premonitions because from this point on her future was to take a long but steady direction towards her own undoing, fit for Homeric hexameter poetry and irresistible to Shakespeare: Julius Caesar was assassinated (“et tu brute”!) at the feet of Pompey’s statue and Rome was thrown into such a state of turmoil that there was little telling what might come next. Mark Anthony, Julius Caesar’s co-consul of the time thought it best to disappear out of sight to watch what might happen from a safe distance. As Shakespeare so vividly potrays, the Republican assassins failed to take advantage of the situation, perhaps expecting the population to spontaneously rise up and cheer “Hail the Republic!” but at best getting a stunned silence: They had failed to plan the aftermath of their action well enough and Mark Anthony took advantage by making stirring speeches during Julius Caesar’s funeral which turned popular sentiment to his own favour and drove the Republicans to flee the city. 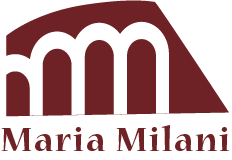 A period ensued in which Mark Anthony with his wife Fulvia took great advantage of the situation. His position as Consul allowed them to take possession of Caesar’s estate and indeed of the state itself (of which they then sold pieces to the highest bidder). No law was passed without their acknowledgement and indeed numerous laws were passed in the name of Caesar ie as laws that Caesar had been writing and intended to ratify. Caesar’s will and last wishes proved to be the true spanner in the works for all : it nominated his nephew Octavian as his adoptive son and rightful heir. Cleopatra was naturally shattered: it hadn’t recognised their son Caesarion as heir and as such very much left her in the cold. All her work had to start from scratch. Cleopatra’s reaction must have surely been utter shock if not anger at this twist of fate which had turned her from being the most likely to succeed back into a foreign ruler depending on the grey whims of Roman politics. To her immense credit she bounced back with a fresh plan focused on the new most powerful man in Rome: Mark Anthony. Her ability to strike a deep relationship with Mark Anthony tells us much about her if we bear into account how sophisticated Cleopatra was. So sophisticated that she had enthralled the rather more intellectual Caesar: with Mark Anthony she played a completely different role, suited to the raucus and wanton soldier that he was. By this time, the political situation in Rome had become very embroiled: Mark Anthony and Octavian were jockeying for position and absolute power. The second triumvirate held great hopes but rather like the first it was destined to fall apart. Cleopatra did her utmost to bring Mark Anthony to Egypt and succeeded. In so doing she had ensured the head-to-head confrontation and was rather sure that her own wealth and power would give Mark Anthony the winning edge. In reality the winning edge was held by Octavian all the way: Mark Anthony’s wife Fulvia was caught red handed plotting and organising troops against Octavian and hence forced into fleeing the country (she died of illness abroad). Octavian then married his own sister Octavia to Mark Anthony as a means of ensuring peace within the Triumvirate but on a more Machiavellian level as a future political lever of public reproach when Mark Anthony betray her for Cleopatra: indeed that was exactly what happened. Octavia behaved faultlessly throughout. Faultless matronly behaviour, coupled with her notorious beauty induced Cleopatra into gripping Mark Anthony even more tightly to herself and Egypt, hence dividing him from the people and popular support who had been his traditional power base. We can thus see how Cleopatra was both an advantage and disadvantage to Mark Anthony’s cause. This time-consuming dalying in Egypt was extremely expensive in terms of political positioning whilst Octavian made continuous progress all the while and established himself as the power in Rome if not the rest of the empire. Mark Anthony’s support was still strong in Rome but continuously weakened by his absense. He made a bald move to follow in the steps of Caesar by planning a massive invasion of the Parthian empire which would have made him nigh on invincible in Rome as well as abroad. Cleopatra’s wealth added to his own might meant that a huge force was amassed to execute the campaign. Unfortunately, much in line with his character, he got ahead of himself, quite literally. His cavalry sped ahead into the desert and left the long trailing caravan of siege machines and supplies behind and open to Parthian attack. The long and short of it was an ignominious return with shattered, demoralised and defeated troops. More significantly, his own self esteem was sorely damaged and hardly restored by an easy win and annexation of Armenia which gained him a triumph in Rome but didn’t make up for the losses in Parthia. The continued tug-of-war with Octavian and Mark Anthony’s divorse from Octavia brought Octavian to find just cause in declaring war. Mark Anthony’s supporters were forced to flee from Rome and the stage was set for a final clash. Octavian declared war not on Mark Anthony but on Cleopatra as enemy of the state, thus not putting the Roman people’s love of Mark Anthony into question but focusing the attention on the foreign threat that would conspire to control Mark Anthony and Rome itself. A perfect political move which was to be coupled with perfect and meticulous military strategies c/o Octavian’s brother in law Agrippa. Cleopatra’s presence in Mark Anthony’s camp was a clear motive for discord, whilst Octavian’s camp were working in harmony. The Egyptian navy was huge and made of enormous heavy ships whilst Agrippa opted for light war ships which he modified to allow his troops to engage directly. Octavian and Agrippa made a couple of pre-emptive moves to ensure that Mark Anthony didn’t threaten their own shores in Italy and then took some strategically essential outposts. Mark Anthony’s forces at sea were therefore pinned into an insalubrious bay known as the Ambracian Gulf: riddled with disease, cut off from their forces on land and provisions. Not a great prelude to a battle of the titans. Though Mark Anthony’s forces held out valiantly they were defeated. Mark Anthony retreated to Alexandria and various plans were hatched with Cleopatra, including that of extending the Egyptian territories eastwards and gaining strength for a second bite at the cherry. Mark Anthony’s mood and morale continued its downward spiral and except for some sparkles of hope and courage his boyish character was little match for Octavian’s and Agrippa’s ruthless determination. His last acts of note were his personal home built in isolation before the sea, testimony to his desperate introversion and self pity and the feasts of the final months. In this time Cleopatra searched and tested a variety of poisons to find the one which might suit her most as swift and painless. Cleopatra had closed herself in her mausoleum (tomb) and we can well imagine Anthony shouting to be let in. He was pulled up the side of the building and in so doing left a gory line of blood up the wall. Once in he asked for a glass of wine and promptly died. Cleopatra, we are told, was distraught and not so fortunate either: Romans stole into the building unnoticed and prevented her her own intentions of suicide. We can well imagine how she may have tried her utmost to sway Octavian the way she had with Caesar and Mark Anthony but to little avail. She attempted negotiation and only obtained that she be allowed to bury Anthony in her mausoleum: She was no longer the youngster she once was but rather a 40 year old who had mothered children and been consort of both his father and his brother in law. Nevertheless she had much of her natural charm still within her but it was little match for Octavian’s cold calculation and steadfast purpose. With the removal of Anthony and Cleopatra the stage was set for Octavian to take total power of Roman dominions and have himself nominated “Emperor Augustus Caesar”.